Justin Perreault. Journal photo by Jordan Wald. Justin Perreault stands only 5 feet, 10 inches tall and weighs just 135 pounds soaking wet. But the Homewood senior right-hander has not let his somewhat diminutive stature prevent him from becoming one of the most dominant high school pitchers in the state. Perreault has been unbeatable and nearly unhittable this season, fashioning a 7-0 record with one save and an 0.93 earned-run average. In 52 2/3 innings, he has allowed only 19 hits and 14 walks while recording 69 strikeouts. 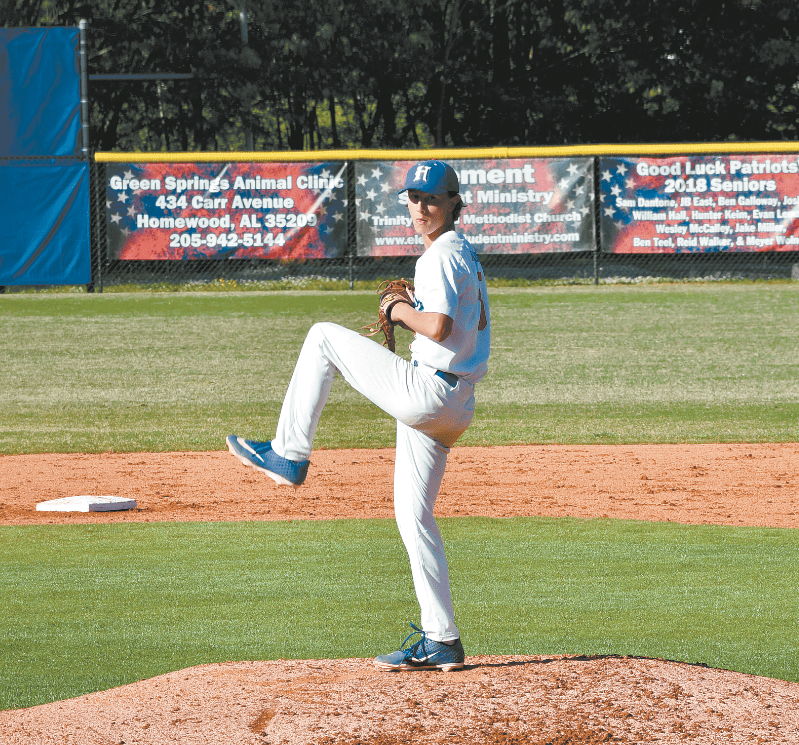 Perreault will be on the mound at 4 p.m. Friday when Homewood (18-8) plays host to McAdory (10-14) in the first round of the Class 6A state playoffs. The second game of the best-of-3 series will follow at 6:30 p.m., and a third game, if necessary, will be played at noon Saturday. Cullman swept Homewood 8-1 and 6-1 in the 2018 Class 6A quarterfinals with Perreault taking the loss in the first game, allowing seven runs on six hits, while walking two and striking out three in five innings. But when the teams met earlier this season, Perreault pitched a complete game, allowing only an unearned run in the final inning of a 3-1 Patriots’ victory. He walked four and struck out nine. “He’s an elite, elite competitor,” Brown said. “He’s beaten some of the best teams we’ve played: Cullman, Helena, Gardendale and Hueytown. Perreault admits that his slight build sometimes gives him an advantage because some teams see him and take him lightly. “When me and my parents would show up for a game, even when I was playing travel ball, you could see that look in their eyes, like, ‘What can this little kid do?’” Perreault said. “They were surprised when they saw me throw. Brown believes Perreault has a classic throwing motion. He sometimes has an over-the-top delivery, but mostly he throws from a three-quarters release angle. “If you’re going to teach somebody how to throw the ball, you would show them Justin,” Brown said. “He has great leverage and he locates his pitches. The ball just jumps out of his hand. “His fastball sits at 85-87 mph and he has a plus breaking ball and a plus cutter, and he has a changeup that he throws against left-handers. Brown ranks Perreault among the top pitchers to come through Homewood, including guys such as Austin Hubbard, Parker Gargis, Adam Stewart and Brian Browning. Each of them went on to pitch in college – Hubbard at Auburn, Gargis at Samford, Stewart at David Lipscomb and Browning at Northwest Florida State College, Ole Miss and West Florida. Perreault will pitch at the next level, having signed with the University of Alabama in Huntsville. Brown said UAH is getting away with larceny by landing Perreault.